Over 95% of our students increase their SAT scores by 100-300 points overall! Our curriculum gives you the individualized attention you need by identifying your strengths and weaknesses and teaching you quick, tangible strategies to raise your score in a short amount of time. We guarantee you will feel more confident and more prepared on the day of the test. Over 95% of our students increase their ACT scores by 4-6 points overall! 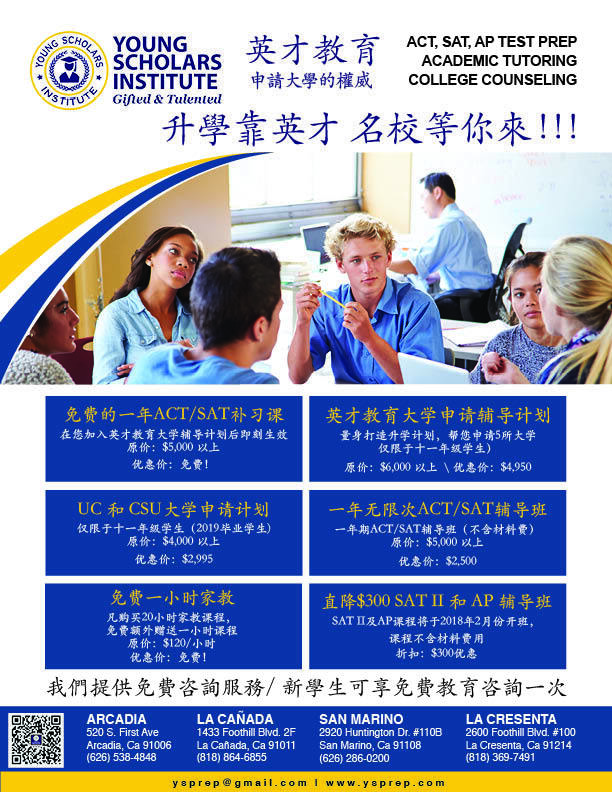 We offer the ACT Test Prep course to strengthen student’s comprehension in English, Math, Reading, Science and Writing. Our customized individual program will teach specific test-taking strategies unique to the ACT that will increase student’s scores. If you’re trying to get into a top-tiered college, or even a highly sought-after UC, the SAT II Subject Tests are a necessity! Take our crash course to maximize your score and help you stand out from other college applicants. Taking AP Exams will help students have the competitive edge in college earning them early College Credits prior to entering college. We offer AP Subject tutoring to help assist the student target high scores to master the subject. 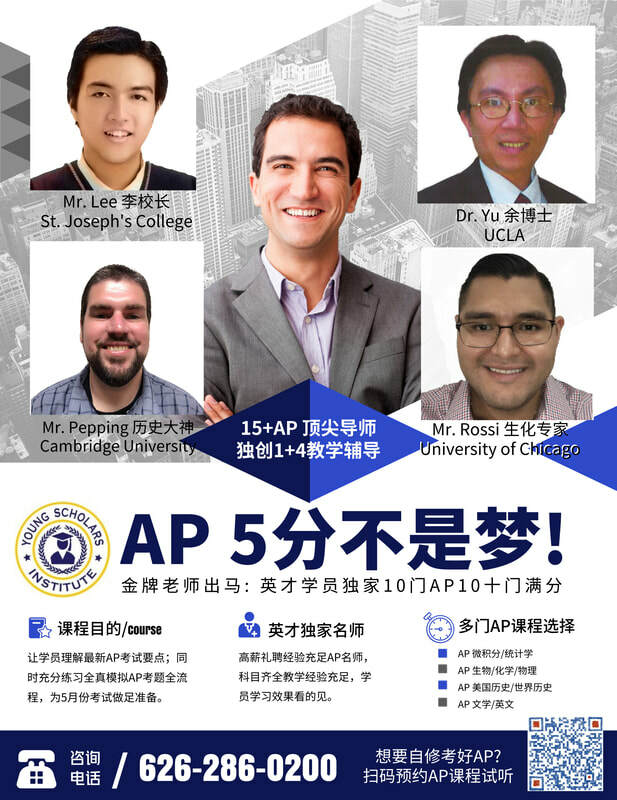 Check with us for a tailor-made program for your unique AP class. This program is designed to prepare students for the entrance exams to the most elite private elementary, middle, and high schools in the country. Tailored to meet student needs, this individualized course includes both tests and lectures, covering all sections of the test. 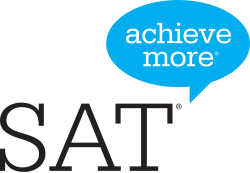 SAT® is a registered trademark of the CollegeBoard, which was not involved in the production of, and does not endorse, this product. 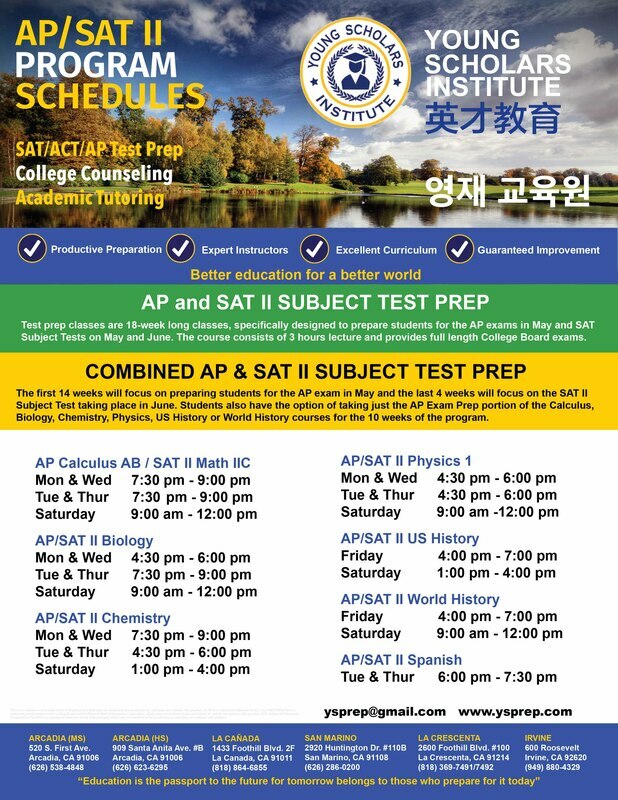 ACT® is a registered trademark of ACT, Inc. PSAT/NMSQT® is a trademark jointly owned by the CollegeBoard and the National Merit Scholarship Corporation, which were not involved in the production of, and do not endorse, this product. 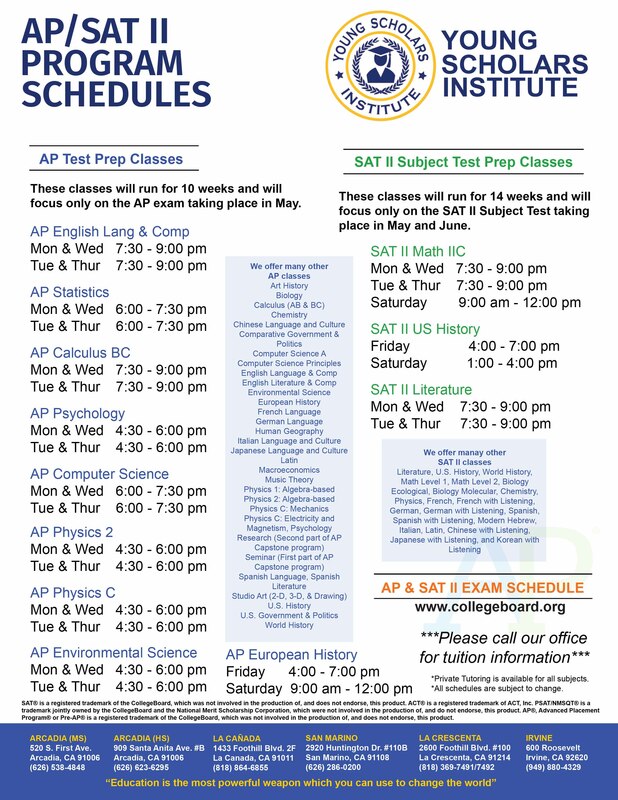 AP®, Advanced Placement Program® or Pre-AP® is a registered trademark of the CollegeBoard, which was not involved in the production of, and does not endorse, this product. TOEFL is a registered trademark of the Educational Testing Service, which is not affiliated with YSI. 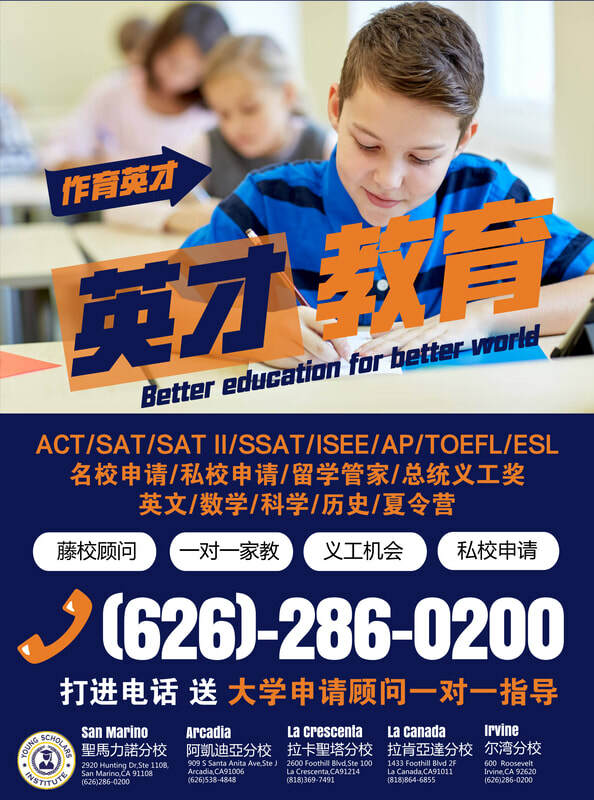 SSAT is a registered trademark of the Secondary School Admission Test Board, Inc. ISEE is a registered trademark of the Educational Records Bureau. GRE is a registered trademark of the Educational Testing Service (ETS). HSPT® is a registered trademark of the Scholastic Testing Service (STS). 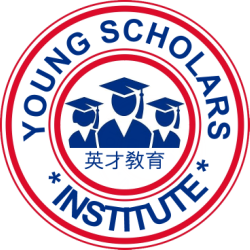 None of the trademark holders are affiliated with Young Scholars Institute or this website.